After a day in the car it was necessary to revert to the bikes. So a lovely ride through the local countryside was undertaken. 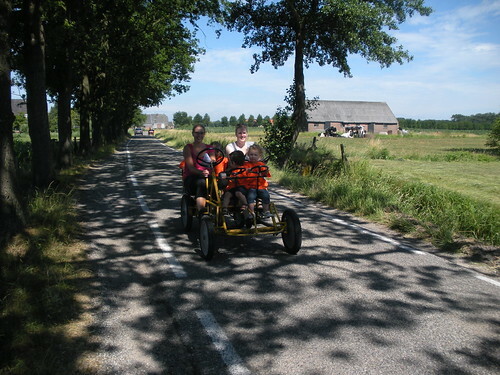 Here’s an unusual thing we saw: several kilometres out of Driebergen we passed a vehicle that had 4 wheels, 2 adults pedalling, 3 children in the front seat and 3 or 4 in the back. The adults were child care workers from the Driebergen child care centre and they were taking the children on an outing. You can’t imagine that happening in Australia! Our ride included 2 ferry crossings of the Lek, a stop for ice tea at Amerongen and another visit to the lovely town of Wijk bij Duurstede. Ian and Kees then went to a bike shop to explore customisation of Ian’s bike to enable him to cycle in a more upright position. I went on a trip to Utrecht and while walking around the town saw several babies being transported on bikes in capsules attached to the rear carrier. It’s quite a surprise to see a pair of chubby baby legs waving in the air and a string of toys suspended above for it to play with while being conveyed on a bike! As it grew dark, Wieteke and I had a session of gypsy music in the garden, she on the violin and me on ukulele. Watch out gypsies! Not that there are any around here. The people of Driebergen were unmoved. This entry was posted on 8 July 2010 at 8:33 pm and is filed under Netherlands. You can follow any responses to this entry through the RSS 2.0 feed. You can leave a response, or trackback from your own site.